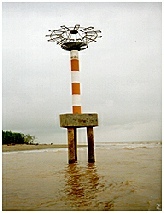 The River Navigation Beacons Light system consists of thirty nine (39) beacon constructed on the river banks (between high and low water) along Batang Paloh from Kampung Pasir extending upstream to Tanjung Labaan and Sibu town. The total length of the beacons system is about 80 nautical miles. The distance between beacon varies from 0.3 to 4.0 nautical miles depending on the shape and contour of the river. RC Spun pile of 250 mm diameter was use for the beacon foundation and structure. All piles were driven to a minimum of 15 meters into riverbed so as to provide lateral stability and expose minimum of 5 meters elevation above Mean Higher High Water (MHHW) to provide a platform for the light system.